London based Fantastec, a top innovator of sports fan technology, announced February 22nd that it signed its first licensing agreement with a Premier League Team, Arsenal FC. Fantastec has created a new blockchain validated collectibles app called Fanastec SWAP which lets fans locate, collect and trade licensed team collectibles with other passionate fans. Such items include exclusive team video footage and player autographs. Because the app is blockchain technology-based, fans can trust all materials they discover, amass, and trade is official and licensed. Fans can have peace of mind that all others on the platform are also legitimate and trustworthy. This concept can bring the age-old art of collecting into the 21st century. Fantastec SWAP is the app that makes all this possible, allowing an old practice to be not only modernized but the security of each item and transaction guaranteed. The Fantastec SWAP app encourages fans to not only build their arsenal of goods but also swap with other dedicated fans around the world. In essence, they have created a game based on incentives in which fans are rewarded for completed club albums along with other collections. Once a fan achieves a set level, they are given rarer pieces to find and with those come increased rewards. While the exact rewards are not yet released, the idea is to have SWAP players who achieve their goals earn real rewards with the actual Arsenal FC. Why is blockchain used? Blockchain is a digital ledger that keeps a record of all users online transactions while also maintaining a regulated supply of all collectibles. The blockchain platform offers users social network like characteristics allowing fans to swap collectibles with the same trust and confidence as if they were doing it in person. Blockchain cannot only be used to prevent fraud but also limit the digital supply of collectibles and cryptocurrencies to guarantee all items maintain their value. 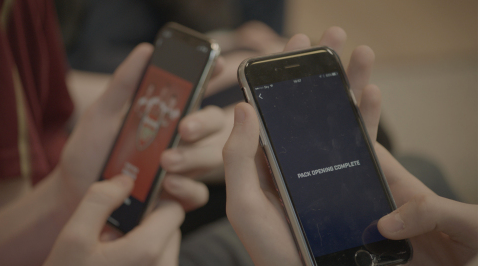 The hope is to have many more football clubs join the platform, creating a Premier League incentivized app for all to use, love and reap the fantastic benefits. The Fantastec SWAP app is now available on Google Play or the App Store. For more details on the App Click Here. And the blockchain movement does not stop there. Brands like Johnson & Johnson were able to boost the purchase intent of several of their brands with various campaigns on Dabbl. Dabbl is a mobile app that allows marketers to reward consumers if they give their opinions on a product. Comcast NBCUniversal is also looking to launch a streaming service that would pay individuals to watch it. The app would tentatively be called Watch Back, and it would feature episodes from NBCUniversal networks like Bravo, USA, and NBC as well as outside websites. Watch Back hopes to entice more people to watch by awarding those who do with points which are redeemable for gift certificates. It is clear that companies are looking towards blockchain to build secure incentive-based platforms to not only grow various brands but also learn more about consumers and their behaviors. The goal for all brands is to drive consumer participation.